V I C T O R Y A T T H E G A T E S - Government intrusion into our private lives is at an all-time high: unfettered surveillance, massive entitlement programs to redistribute wealth, unelected activist judges trampling religious freedom. The Founding Fathers said our nation demanded a moral, educated, and principled populace to keep elected officials in check, to keep our government and culture clean and free of degrading forces, and to maintain its foundational core values. Today we see what happens when unchecked, greedy, self-serving utopian politicians get the free run of Washington. What can you do about it? 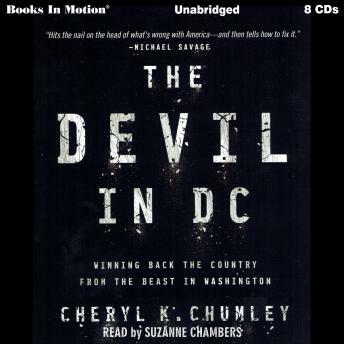 The Devil in DC provides more than a dozen different ideas on how to turn back Big Government, stressing the importance of · knowing the Constitution · getting out of debt · holding elected leaders accountable · voting, volunteering, and running for office · standing fast in the face of the progressive onslaught · confessing, repenting, and praying. The Bible teaches of “a time to love, and a time to hate; a time for war, and a time for peace” (Ecclesiastes 3:8). Right now, with chaos and turmoil increasingly engulfing America, this is a time to fight—by following the battle plan in The Devil in DC.